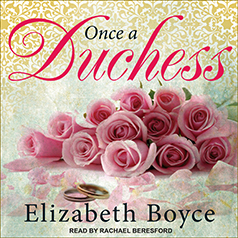 Elizabeth Boyce presents the first book in the Once A . . . series. Contains mature themes. Isabelle Lockwood was a duchess, until her husband of only a few months wrongfully divorced her for adultery. Since then she's been a pariah, living in anonymous exile to escape the prying eyes and wagging tongues of the town. More than anything, Isabelle longs for a family of her own, and so has to marry again. But society is ruthlessly unforgiving. To clear her name, Isabelle must face down her past—and the man who broke her heart and ruined her completely.